Question: What exotic fruit has been named as a flavor in Starburst candy, Ice Breakers gum, SoBe beverages, Vitamin Water drinks, Bacardi rum and even Axe body spray? So while many of us may have tasted products that flaunt its name, have you ever sunk your teeth into a fresh dragon fruit? If you want to try one, you may be in luck because now is the peak harvest season in Southern California for this subtropical cactus fruit with the fire-breathing name — also known as pitahaya. 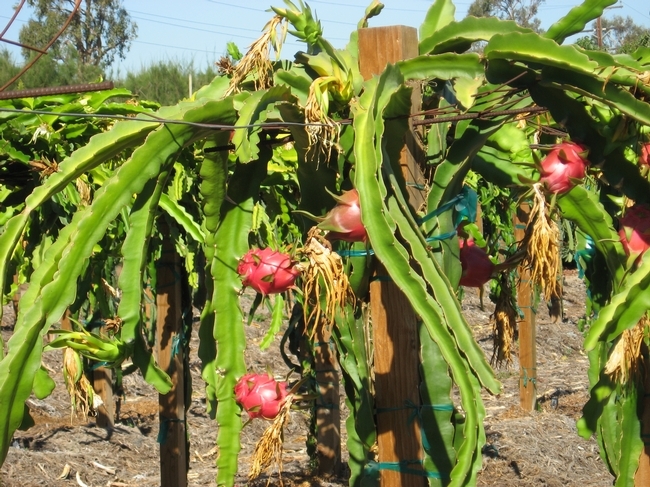 And it just so happens that growing and eating fresh dragon fruit is what Ramiro Lobo, UC Cooperative Extension farm advisor for San Diego County and the Small Farm Program, is most interested in. 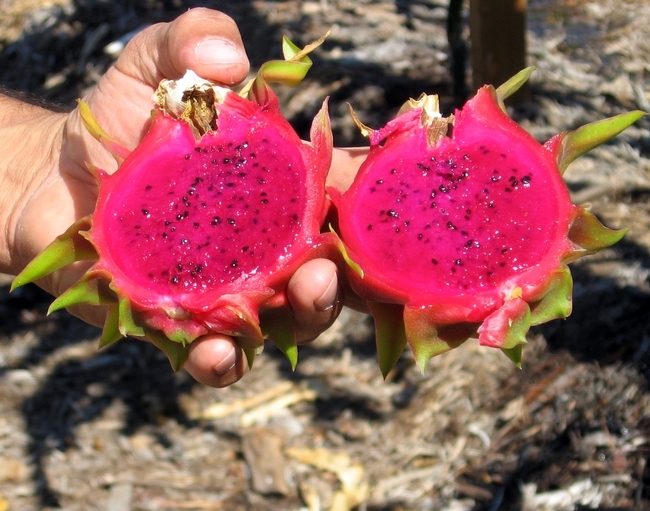 Lobo says he’s known about pitahaya since he was a kid, but his professional interest was rekindled when the enthusiasm of the Rare Fruit Growers group intersected with an ongoing quest to find crops that are more water-efficient for the region. Though this used to be a fruit found only rarely in specialty stores, Lobo says that is changing. One other clue that the U.S. market for this “artichoke from Mars” (as one LA Times writer described it) is expanding? Imports of the fruit have been growing from Vietnam, with perhaps 600 tons imported in 2010. And the USDA is currently working through the processes that could allow imports from Mexico, Thailand and Central America too. While Lobo doesn’t sound too worried about competing with imported dragon fruit, he does hope your first taste of fresh dragon fruit is indeed very fresh. In California, it is estimated that about 200 acres are planted in pitahaya, with anywhere from 400 to 1,000 acres planted nationwide. 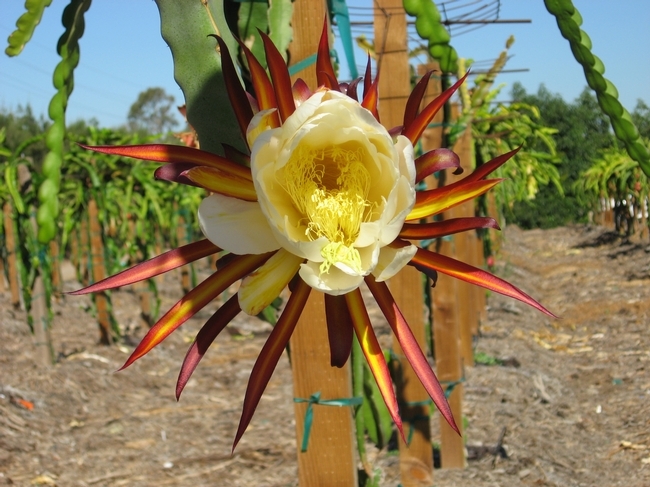 Lobo oversees approximately 500 dragon fruit plants at the UC South Coast Research and Extension Center in Irvine. 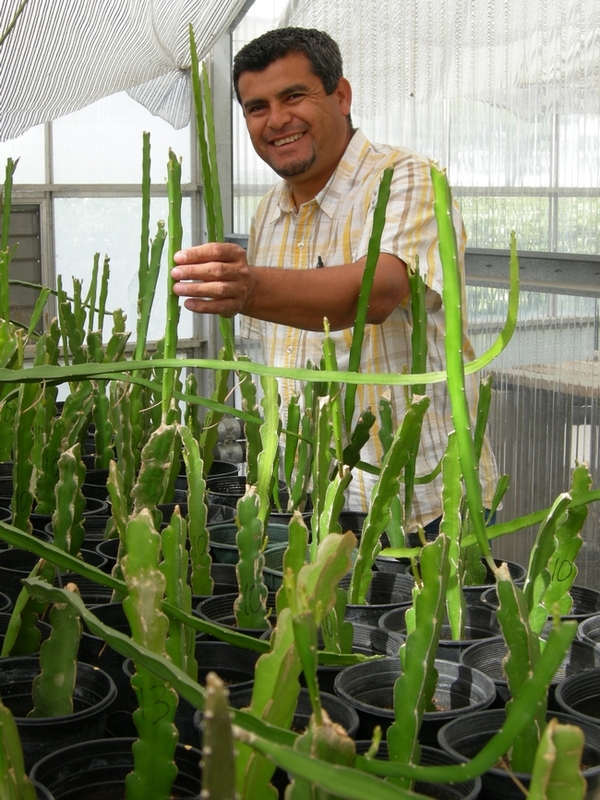 He is currently working to set up an irrigation trial for pitahaya, to better evaluate its water requirements. He is also working to test out different trellis systems, comparing hedge versus orchard systems for this fruiting cactus. The UC South Coast Research and Extension Center is also where the pitahaya field day was held recently. Lobo said questions from the day’s 100 or so participants sounded like more growers are getting serious about growing pitahaya commercially, with more technical questions and an interest in disease, rodent and pest management. “The bar has been raised, and [some of those questions] even put us in a bind because without the research, it is kind of hard to answer them,” he said. In the meantime, Californians and marketing companies will probably continue to find new secondary uses for this fruit’s juice, pulp and name: Lobo says he’s seen wines made with dragon fruit and organic yarn dyed naturally with that fiery pink flesh. Cactus with pink pitahaya hanging from it has grown up a pole and out over a wire canopy, creating a tree-like form. 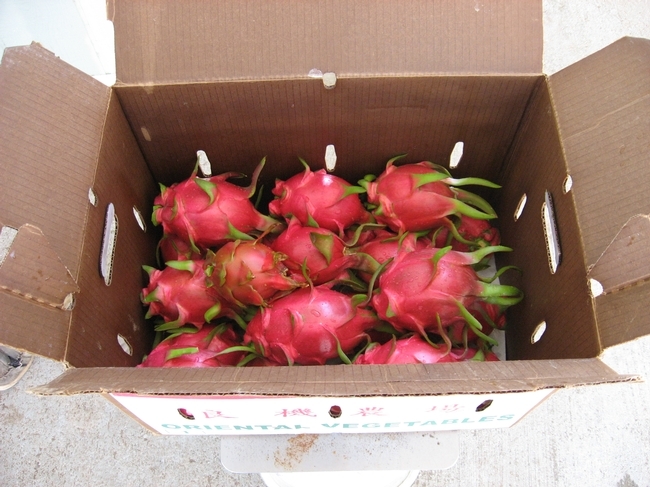 Colors of ripe pitahaya flesh can vary between red, fuschia, pink and white. Great! One of my favorite fruits (dried) Love the protein it contributes (dried) Love the hype. Great food! Great article! Thank you! Thanks, Sharon! I hadn't heard before about dragon fruit also providing protein. Is that perhaps from the seeds? When it comes to health benefits, I more frequently hear about this fruit's potential antioxidant activity. And I'm with you on eating it dried -- very fun! where can you buy some plants? Is there a current collaboration with Mexico growers an UC? If none of these source work, please feel free to contact our office at 760.752.4724 and we will try to assist with locating plants or other sources. Currently there is no formal collaboration between UC and growers or researchers in Mexico. 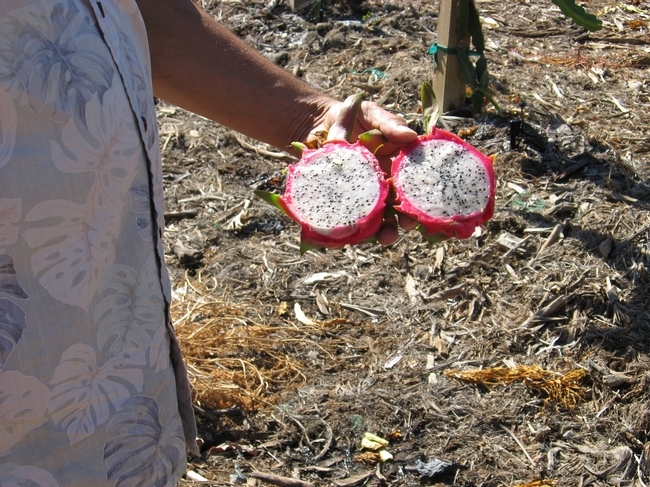 However, since the inception of our Pitahaya/Dragon Fruit research projects, I have communicated with researchers from the University of Colima, the University of Guadalajara, and INIFAP who are also working on various aspects of pitahaya or dragon fruit production. Someone could tell me where I could buy a relatively large amount of cuttings of dragon fruit?  Could you tell me an e-mail to contact? The protein does seem to come from the seeds. It looks as though it would be an easy fruit to dehydrate, although I haven't yet tried it. Go farmers!I can see it being near as popular as kiwis, if it is properly promoted. I just bought a small acreage south of Tampa Bay area, mid-state Florida and am planning to try growing pitaya here. I have a half dozen plants started so far. Any recommendations for trellis posts? We have termites galore here & I've read pitaya don't like pressure treated, plus I'd like to stay organic. I may try cypress slabs, but how about cement posts? Would that work? Lovely Fruit. Fadlo J. Hourani, it's good to see you're still kicking!! My question is that the roots which are grown on leaf can it be removed ? Because it attracts white insects which are found on guava tree. and for root cuttings which chemical is used before re-planting the cuttings into soil ?